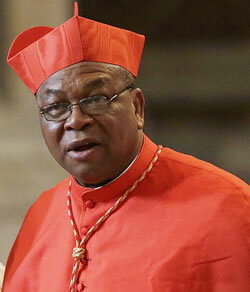 Catholic Archbishop of Abuja Diocese, Cardinal John Olorunfemi Onaiyekan has proffered a round table discussion as the tonic to the various crises Nigeria and mankind in general is currently faced with. Archbishop Onaiyekan suggested this in Abuja over the weekend at the 2018/2019 edition of the Cardinal Onaiyekan Foundation for Peace (COFP) Fellowship Programme on Inter-religious Dialogue and Mediation. The Archbishop who recently bowed out from active missionary work pointed out that those who seek peace should not segregate against fellow humans. The cleric added that dialogue is a very potent weapon for resolving conflicts no matter the difficulty. “Every conflict can be resolved, once you are able to sit down together, look at each other face-to-face, you will now realise that every human being is just exactly like you, like your brother, your cousin which is what you have seen.” He stated. The programme witnessed the graduation ceremony of about 35 students consisting 18 Christians and 17 Muslims drawn from the six geopolitical zones. This entry was posted in Belief, Christianity, News and tagged Cardinal John Olorunfemi Onaiyekan, Cardinal Onaiyekan Foundation for Peace, Catholic Archbishop of Abuja Diocese. Bookmark the permalink.